Seamus Hennessy remembers Josie as "a very kind, very glamorous woman, a great mother". But in February 2000 Josie felt like she couldn’t go on in this world any longer and ended her own life, leaving 10-year-old Seamus without a mother and his father, also Seamus, without a wife. A beloved sister, daughter and friend was gone and the heart was ripped out of a local community. Suicide leaves behind incalculable grief and loss that informs the remainder of the lives of those in its wake. Hennessy says he will be forever grateful for his father’s foresight, sending him to a child-specific, group counselling course shortly after his mother’s death, equipping him with many of the tools to deal with his grief. Today he will undertake an epic challenge to raise money for suicide charities and raise awareness around the issue of suicide. "I was very fortunate and I am thankful every day that my father had the foresight to bring me to a Rainbows Ireland group the following September, which is essentially as 12-week child counselling course that I underwent," said the 28-year-old, speaking to RTÉ Sport. "I don't want to be dramatic, by any means, but I’m safe in saying and I’m not overstating it to say it’s the most transformative thing that happened in my life. "It was a child-friendly course, there were other children there who had their own parental difficulties in their own lives. "We played sports, we had music, arts and crafts and then for a few hours every evening we’d use our journal and notebook to go through a few questions and thoughts; put down on paper some feelings, even at that age, as to what was going on in our lives. "I guess that process, that 12 weeks, enabled me then to be comfortable with being vulnerable and not feeling as though I couldn't talk. "If this is successful that will allow 200 people go through the services of Pieta House, from going through the door the first time to coming out after a successful period of therapy"
"That’s my message and my story - talking about it and expressing how I felt was hugely beneficial to me and I would feel for people who are suffering, and I talk primarily about suicide because that’s the lens I have the experience of, I believe talking is a great therapy, a great way to help equip to deal with whatever challenges that you face." Hennessy was a part of the golden generation of Tipperary hurlers that won All-Ireland minor medals in 2006 and ’07 and added senior and Under-21 All-Irelands inside six days one glorious September week in 2010. He came off the bench in the senior final, scoring as Tipp ended Kilkenny’s five-in-a-row bid, and was central to the Under-21s demolition of Galway on an emotional Saturday night in Thurles. Surely this was only the start. "That didn’t work out for me like that, did it? It didn’t work out like that at all!" he laughs. "Certainly not the way I would have hoped after 2010. "I dreamt of having a good career with Tipperary. But it didn’t happen. I played half of a League game for Tipperary in 2011 under lights against Kilkenny in the first round and I had a bit of a knee complaint." That bit of a knee complaint turned into four knee surgeries and three years out injured. He’s just thankful to be able to hurl away with his club Kilruane McDonaghs, though thoughts of pulling on the blue and gold again are long gone. Hennessy took some time off last year and went backpacking around the globe and he devised an ambitious plan for 2018 - run 18 marathons on seven continents to raise money 18 years after his mother committed suicide. Again, Seamus senior showed his wisdom and told his son to scale it back a small bit. So instead today he is running an ice marathon - 26 miles over a glacier on the Antarctic with the aim of raising €200,000. He has also roped in a number of friends, most of them currently non-runners, who did the Dublin Marathon in October. He thought about putting a treadmill in the freezer room of an abattoir, but reckons health and safety won’t let that happen, so he has had to come up with other ways to prepare himself for running for hours on soft snow in sub zero temperatures. "I’m not an endurance runner, I don’t particularly like long distance running and I’m not particularly good at it," he said. "Given the way the GAA season is in Tipperary, I’m not going to have a 12-to-20-week straight run into it so I’m doing a bit of long distance running at the minute and I’m trying to follow the guidelines in terms of how to prep and getting miles into the legs. "You can’t replicate those conditions - it’s going to be minus 30, it’s 70 miles from the South Pole, it’s an ice glacier so obviously I’m not going to replicate that. "I am doing a little bit of visualisation about what it might be like when I get there, but that might be futile as well. "I’m doing my regular GAA training with the club and throw in a run or two a week, one of them a long distance run. It’s a bit troublesome with my body - running on hard ground isn’t ideal, but that’s what I signed up for and that’s what I have to prepare for. "Practically speaking I’m going to try to do two things. One; I’m going to try to do some running on the beach because seemingly the sand and how you foot goes down into the sand is similar to snow and ice. "Also, I’m going to do some cold water exposure courses with Wim Hof, the Ice Man, he has guys around the world accredited to teach his course and they’re supposed to be very beneficial for your breathing patterns and regulating your breathing in very cold conditions. "I’m not looking at it as a challenge, I’m looking at it as an opportunity to get a life experience I may not have got otherwise. I’m trying to see the benefits in terms of the bunch of people I’ll meet for the few days out there, that I’ll be running with, and it’s something very different. "It’s not a physical challenge I ever saw myself doing. I’m trying not to see negatives or challenges, but I’m trying to be realistic as well at the same time. I want to see the benefits, but three and-a-half, four hours in with five or six miles to go, I mightn’t be thinking in the same vein!" Hennessy is a person with a strong social conscience and last Christmas he was involved in the Gaelic Voices for Change project that helped raise awareness and hundreds of thousands of euro for homelessness causes in Ireland. The money from the ice marathon will go to Pieta House, the suicide and self-harm crisis centre, and Living Links, which tries to help those left behind deal with their grief. He is hugely proud to be from Cloughjordan and it was important for him to ensure some of the money he raised benefitted a local cause - in this case Living Links. "When I was growing up we had two pubs in the village of Cloughjordan where I am from and along with my Dad, Mam ran those," he said. "A very kind, very glamorous woman, a great mother, but obviously she had her own struggles and battles going on and unfortunately she didn’t see a way to continue. She took her own life in February of 2000. "Left behind in the aftermath of that was me, as a son, my Dad Seamus as a husband, her brothers and sisters and extended family and her network of friends. I was 11 years old and something as traumatic and colossal as that, you don’t necessarily get your head around it right there and then." 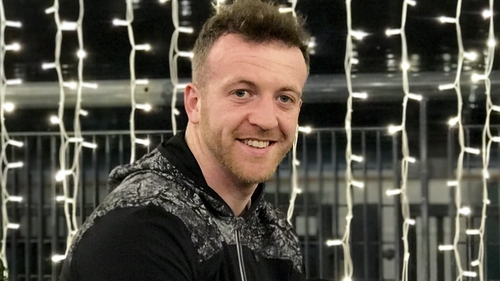 So Hennessy has enjoyed a busy few months, with his full-time job in Dublin in financial services, hurling at home, training for a marathon at the South Pole and raising close on quarter-of-a-million. "These things are important to me; work is important, GAA is important to me, this is very important, the training - I might have to run at obscure times when you mightn’t expect to, but that’s just the way it is!" he said with a smile. "It is busy, but fundamentally I believe that these things are worth doing, they are valuable to me and more importantly I see them as valuable to others so they’re well worth doing. Hennessy continued: "If this is successful that will allow 200 people go through the services of Pieta House, from going through the door the first time to coming out after a successful period of therapy. "That’s 200 people across this island, that’s 200 families, 200 sets of friends, multiples of 200 when you take into account how many people are left behind when someone commits suicide. There’s a huge ripple effect there if this can be successful. "What goes through my mind is those 200 people, that they’ll have access to services, the doors of Pieta House will open wider. I am very open about it and I see it as my duty to Ireland and to my country to do what I can. That’s just how I view it as well." To find out more about Running for Josie, visit the Twitter, Facebook or Instagram accounts.